Is Michael Douglas Smoking Just Months After Battling Throat Cancer? 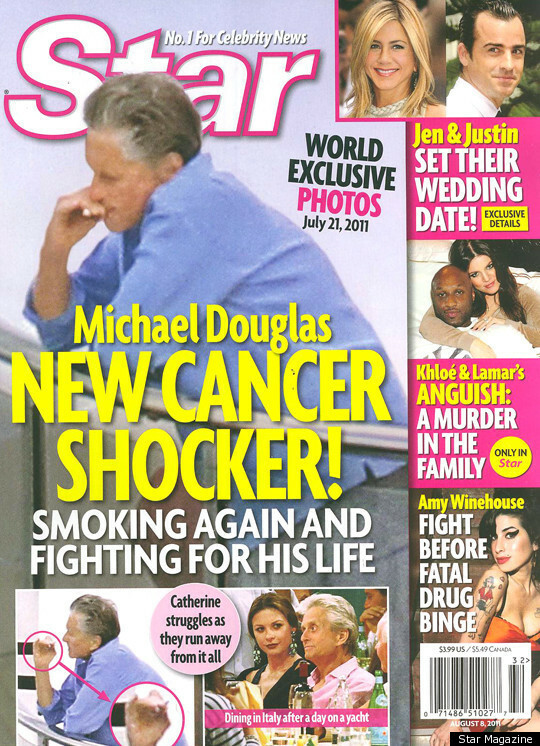 Just months after winning his battle against throat cancer, a photo of Michael Douglas, holding what appears to be a cigarette close to his lips, covers Star Magazine's latest issue. Having just begun to regain a healthy color in his face, Douglas' potential habit relapse has many worried, once again, for his health. Douglas announced in 2010 that he was diagnosed with throat cancer and subsequently went through various stages of chemotherapy and radiation treatments. But what has many shaking their heads now is the fact that, as a survivor of his stage IV cancer diagnosis, he may have once again succumbed to the very thing that put his health at risk in the first place. In August 2010, Douglas told David Letterman that he did have a habit of smoking and drinking -- two guilty pleasures that are often connected to throat cancer. But one month later, Douglas told the UK's Daily Mirror that it was an unhealthy amount of stress that he believes had a direct correlation to his disease. This type of cancer can be brought on by alcohol and tobacco abuse and by a certain type of sexually transmitted reason, but I look at it as stress. I've had a pretty stressful year on a number of fronts, some of which were public and some of which weren't. If the white stick-like object in Douglas' hand is, in fact, a cigarette, his inability to kick the habit may have something to do with his wife, Catherine Zeta-Jones' similar Achilles' heel. The UK's Daily Mail recently published photos of the couple vacationing on a yacht in Europe, Zeta-Jones walking next to her husband holding a cigarette. Although Douglas has been cancer-free since early 2011, according to the Daily Mail, doctors have warned the "Wall Street" actor that he has to take certain health precautions to ensure that the cancer does not return. We hope that the white object in Douglas' hand was just a piece of gum.